BOOOM! Rich Edwards' first commercial project, Pineapple Smash Crew, stealthily went live on Steam just a few hours ago. Which is odd, since the games' only way of communicating is blowing stuff up. It is much like the outsourced tier one tech support guy who learned the three lines he's supposed to say, and repeats them ad infinitum. Only the text is replaced with explosions, and the chap from New Delhi is actually a pineapple. Simply put, PSC is what would happen to Cannon Fodder if it started on a healthy diet of equal parts amphetamines and steroids. 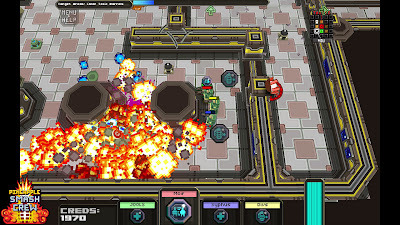 It is a glorious boom-fest in which you lead a team of space pineapples through a series of levels, flicking grenades at everything that moves. Not those of a regular, boring kind, mind you. 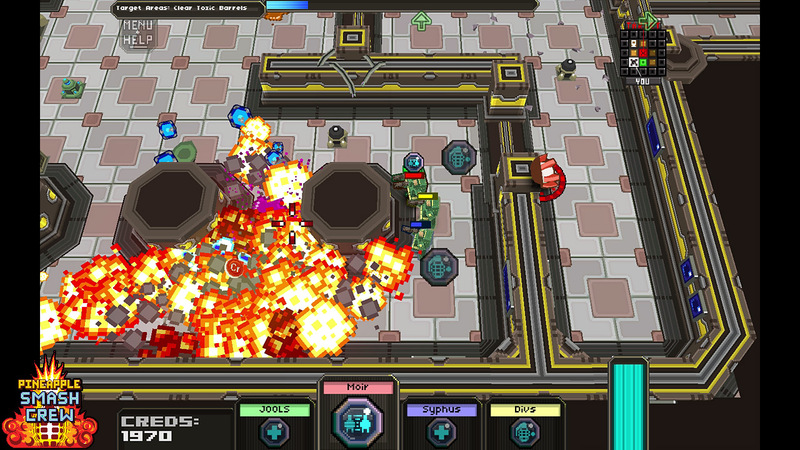 Rich has managed to turn every imaginable weapon into a grenade, for your throwing pleasure. Machine guns, shields, rockets, flame throwers et al have been beaten into submission and stuffed into elegant and convenient containers. Hence, the amount of explosions on screen is just... baffling. The only thing that could make this a more smashing experience is a graveyard feature. I do not want my fallen pineapples to be forgotten. Now go and throw some money at the man.